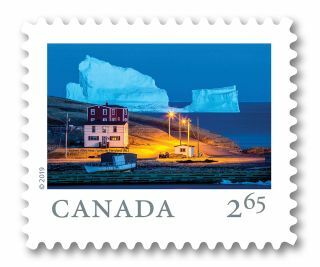 A local photographer from Canada's remote Newfoundland and Labrador province has found worldwide recognition, after his iconic photograph was featured in a series of international postage stamps. Michael Winsor, a Canon photographer who runs photo tours of Canada's easternmost province, captured the stunning blue hour image of a huge iceberg as it docked off the coast of Ferryland in April 2017. The towering iceberg grabbed global headlines, and Winsor made the drive to photograph it himself after seeing other people's images posted on social media. “I wanted to go up there around blue hour, which is just after sunset, because then you get the blue in the sky and things, where the lights just come on," he told The Globe and Mail. "When I turned around the corner I saw it there, just kind of hovering over the houses."